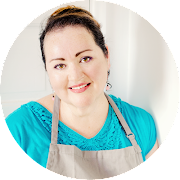 Big bold flavors are important when you're creating dishes that are healthy, low carb and nonetheless delicious. 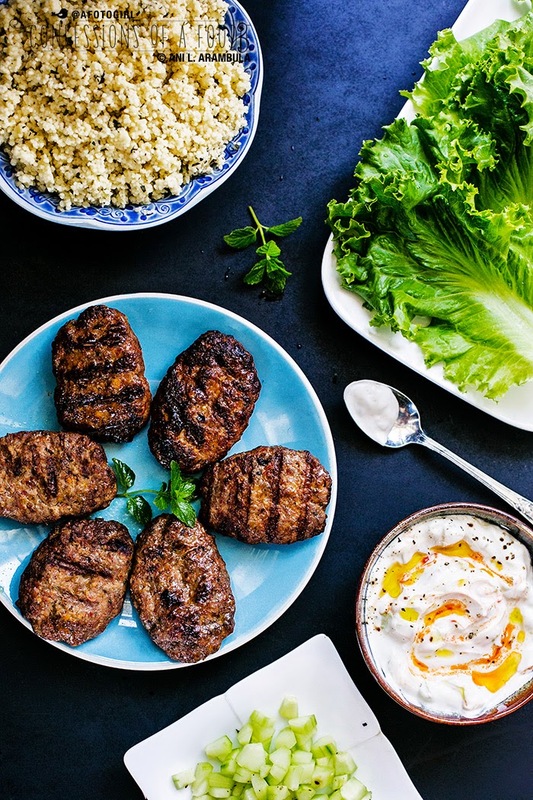 This lamb burger uses harissa for big impact and some heat. 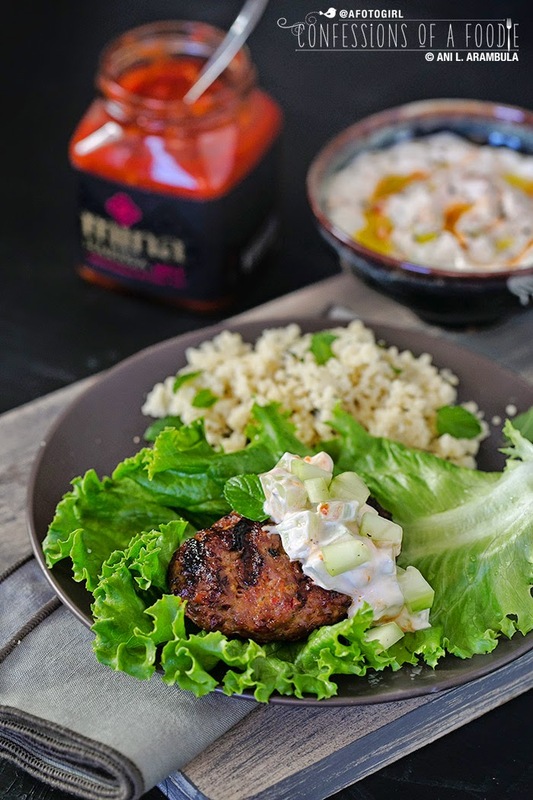 I have a couple more ideas for that Mina Harissa Giveaway: Lamb Burger Wraps and Harissa Spiced Cucumber Yogurt Sauce. Hot and refreshing all in one bite! Try it this Labor Day. Big bold flavors are important when you're creating dishes that are healthy, low carb and nonetheless delicious. 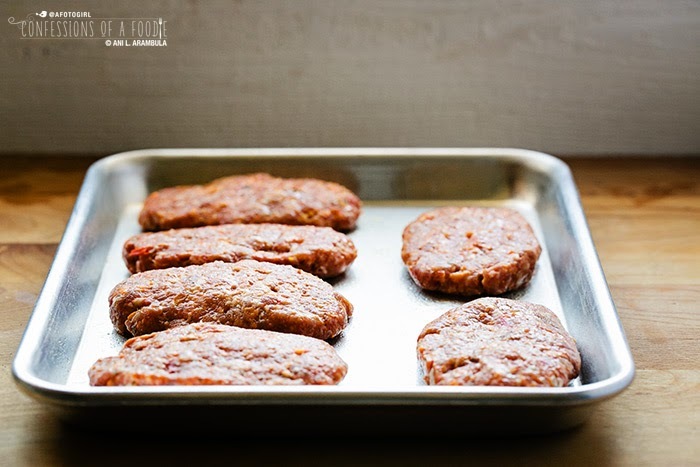 My first non-breakfast experiment with Mina Harissa was this grilled lamb burger recipe. It was utterly satisfying and it definitely won’t be the last time I make it. When holidays come up that involve grilling, I'm always on the lookout for ways to shake things up a bit from the standard hamburger and hot dogs. So when I was considering how to use the Mina Harissa, I immediately thought burgers. And because I'm off white bread right now AND it's been so incredibly warm in sunny San Diego, I thought lettuce wraps. 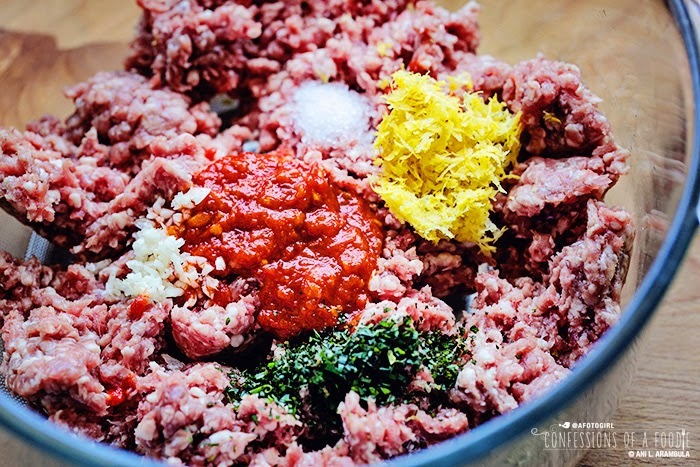 Normally, with lettuce wraps, recipes call for pan frying the crumbled meat. But I got to thinking about how much I enjoy burgers "protein-style", aka, sans buns, so I decided to keep them a burger shape and serve these up in large lettuce leaves. It was definitely a winning combination! Use buns if you must but wrapping them in crisp, cold lettuce (green leaf, butter or even iceberg) is a nice twist and quite refreshing, especially with this hot weather we’re having. And if you feel that lamb is too “gamey” for you, try swapping out the lamb altogether with ground pork, turkey or chicken. It should be equally delicious! Twenty minutes before you’re ready to grill, remove meat from refrigerator and allow to come to room temperature. 1. Make the yogurt sauce: Stir together the yogurt, ½ teaspoon olive oil, lemon juice, salt and pepper. Taste and adjust seasoning. 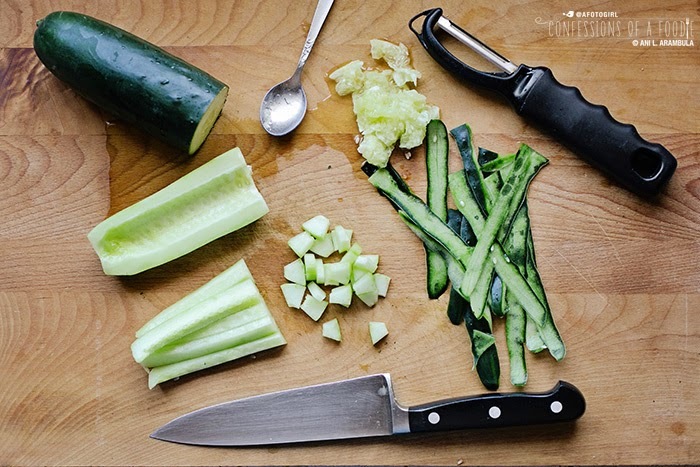 Stir in the cucumber until coated well. Swirl in the harissa. Top off with a drizzle of olive oil (optional). Cover with plastic wrap and place in refrigerator until ready to serve. 2. 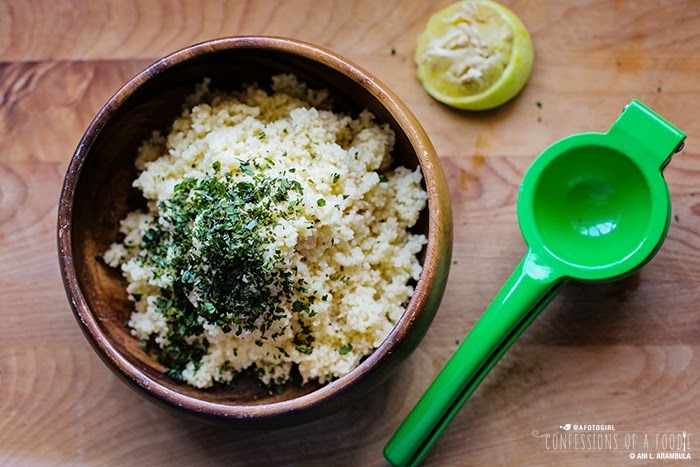 Make the couscous: Place the couscous into a medium bowl. Pour the chicken broth into a medium saucepan and bring to a rapid bowl; remove from heat and pour over the couscous. Stir well to combine. Cover the bowl with a plate or plastic wrap and set aside for 10 minutes. At the end of 10 minutes, uncover and fluff with a fork. 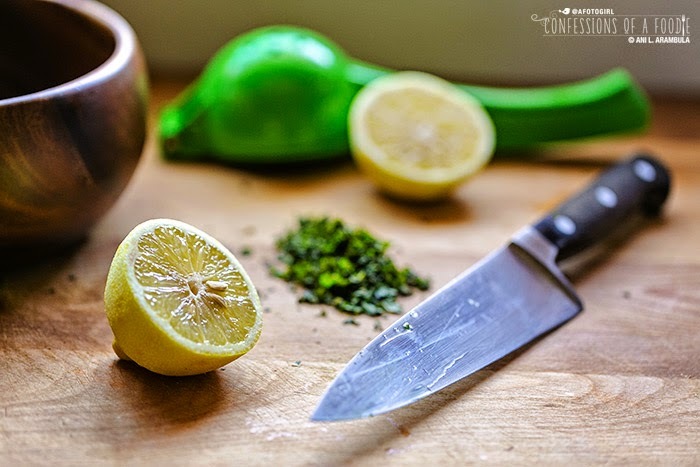 Squeeze in the lemon juice and fold in the mint. Add salt and pepper to taste. Recover and set aside until ready to serve. 3. Make the burgers: Heat grill to medium-high. 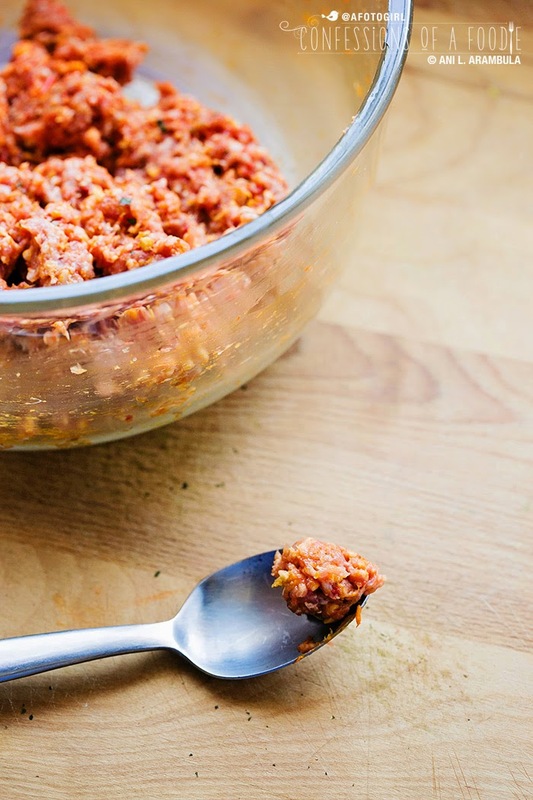 Break meats apart in a large bowl. Add harissa, mint, garlic, zest, salt and 1 teaspoon of the olive oil and stir to combine. Divide meat into 6 equal portions and shape into elongated burgers. Pour remaining 1 teaspoon of olive into a small dish or mug. Dip a wadded up paper towel into the oil and use grill tongs to coat the grill grates with the oil. 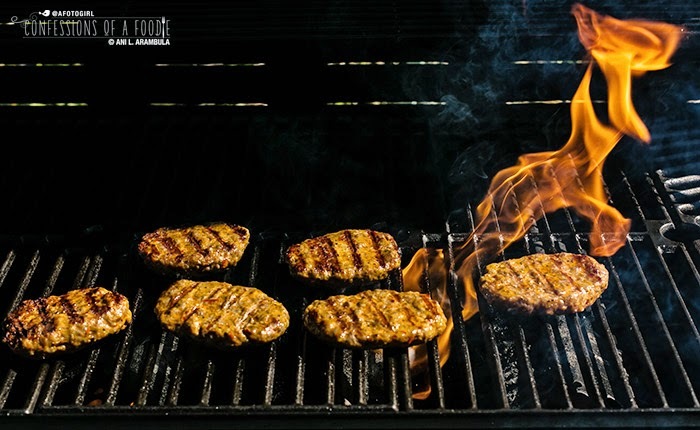 Place patties on grill and cook 3-4 minutes per side with the grill open or until internal temperature reaches 160 degrees on an instant read meat thermometer. Remove cooked patties to a platter. 4. 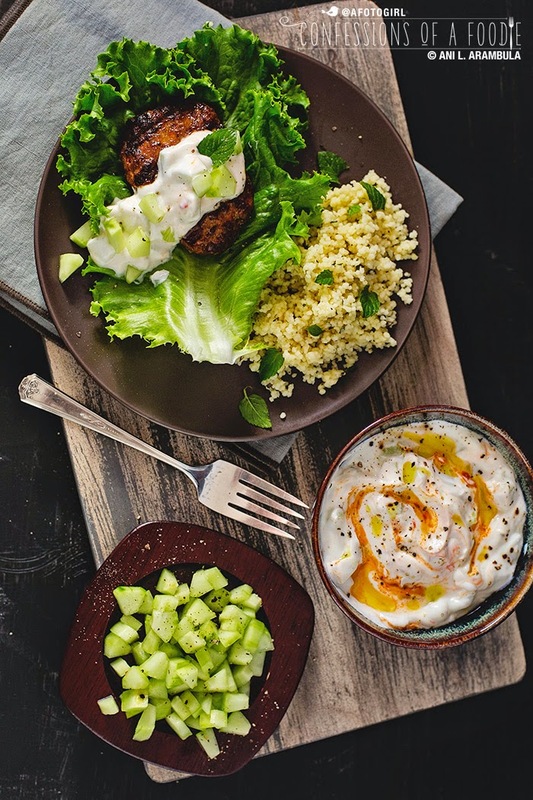 To serve: Place a burger on a lettuce leaf, top with a tablespoon or two of the harissa yogurt sauce. Serve with ½ cup of mint couscous on the side. Garnish with additional cucumber, if desired. Until next time, friends. Have a fun, safe Labor Day weekend! P.S. 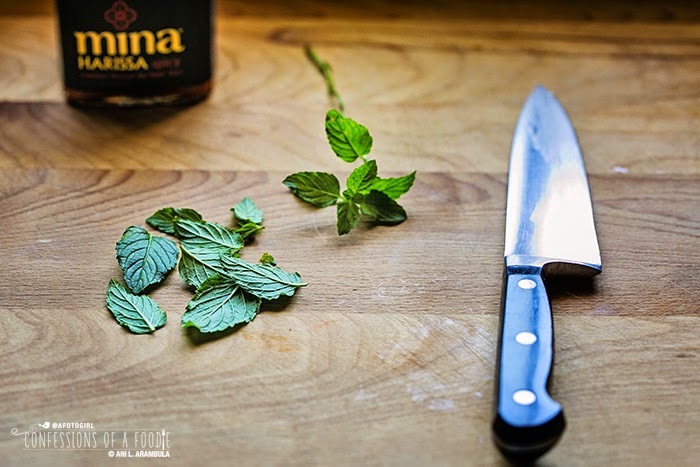 Don't forget to enter the giveaway for a 3-pack of Mina Harissa of your very own! Read about it here. Disclosure: I received two jars of Mina Harissa from Casablanca Foods for editorial consideration. No other compensation was given. Recipes and opinions, as always with product reviews, are my own and not influenced by the brand owner.